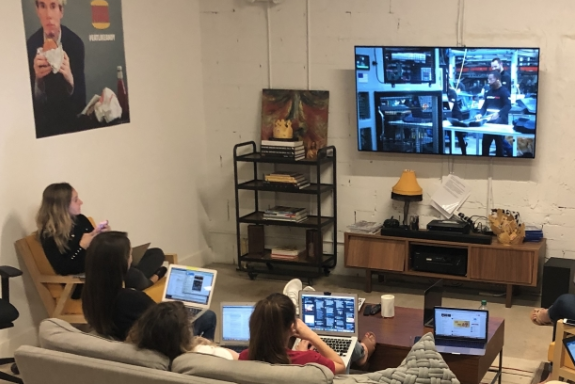 Anytime the words “super” and “bowl” are used together in a client briefing, you know something big, and potentially historic, is about to go down. 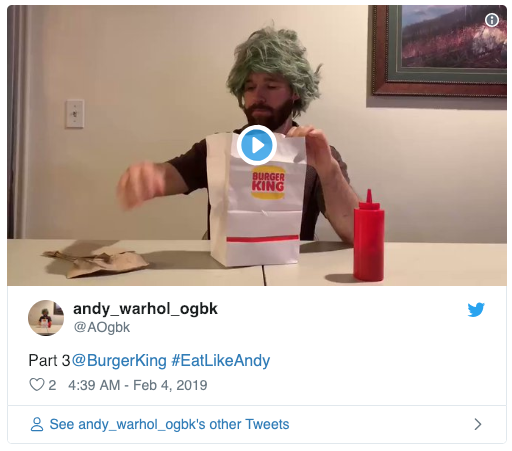 So when Burger King told us we would be supporting agency David Miami’s Super Bowl spot, all hands were excitedly on deck to help amplify it on social. 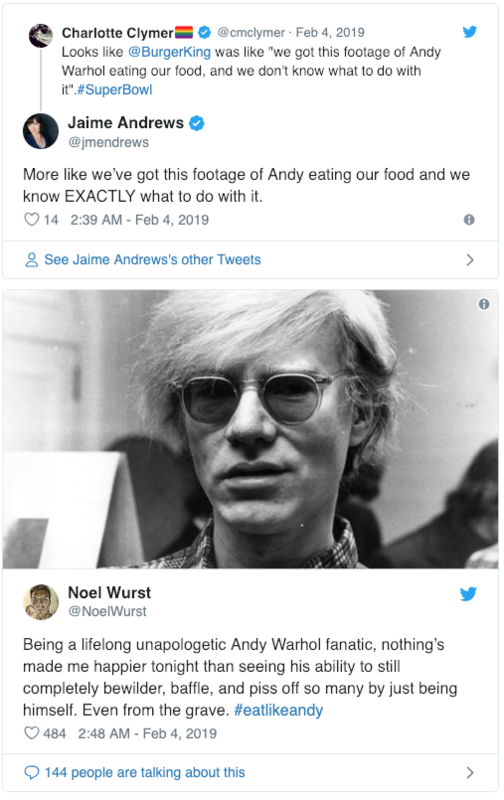 It was immediately clear #EatLikeAndy had the “x factor” consumers would talk, post, and tweet about on social. 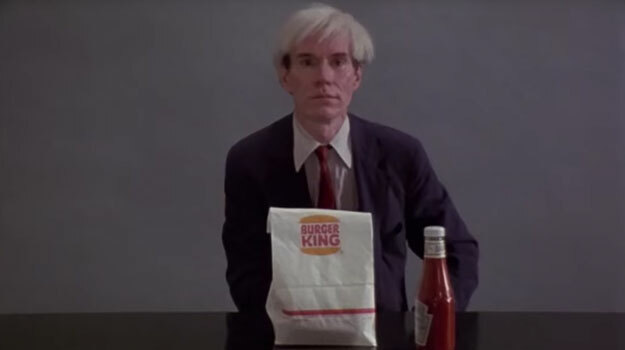 We left our meeting eagerly awaiting the official green light, crossing our fingers that Burger King would air its #EatLikeAndy Super Bowl spot. Each video hinted something unique was being planned, using cryptic copy like “preppin’” and “testing 1-2-3” to allude to the fact that what we were going to air during the game would grab their attention. 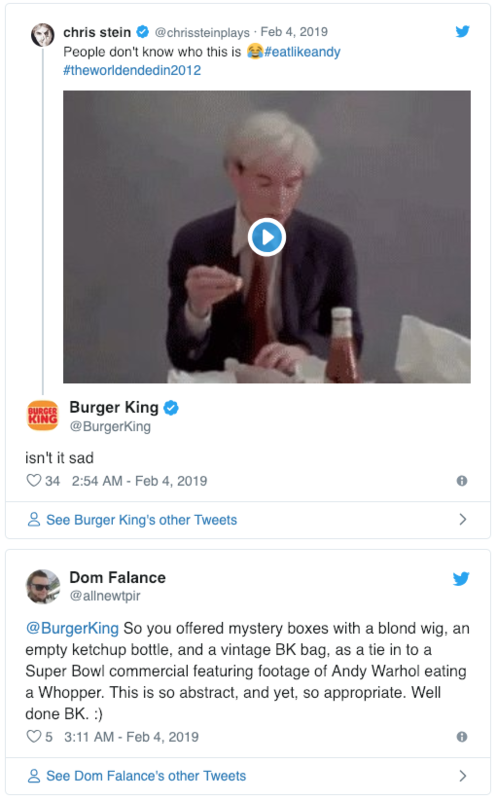 To extend the reach of the campaign in a more participatory way, Burger King worked with delivery partner DoorDash to develop a Mystery Box. 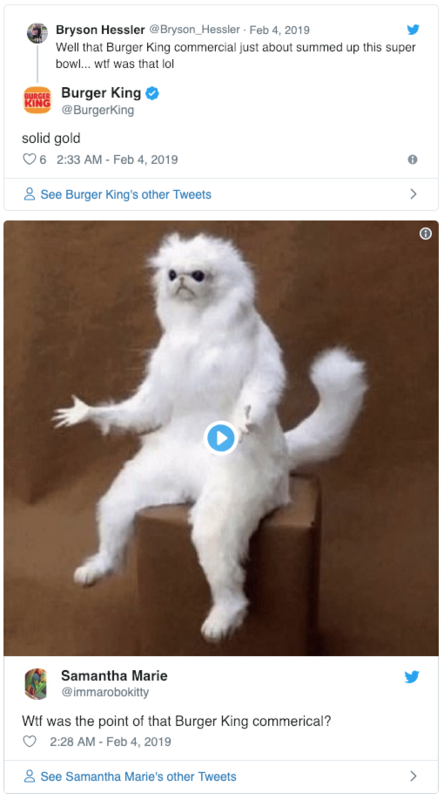 This was a special order customers could place to participate in Burger King’s big game stunt so they, too, could get their “15 minutes of fame” on social, whether they knew it or not. 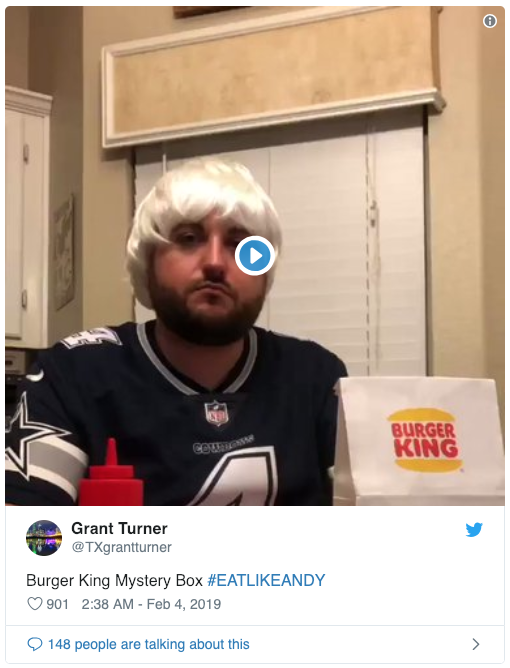 The Mystery Boxes contained white wigs, ketchup bottles, and a note from the brand instructing receivers to hold on to their items until the “big game” on February 3. No further explanation was provided—only an assurance that everything would make sense shortly. 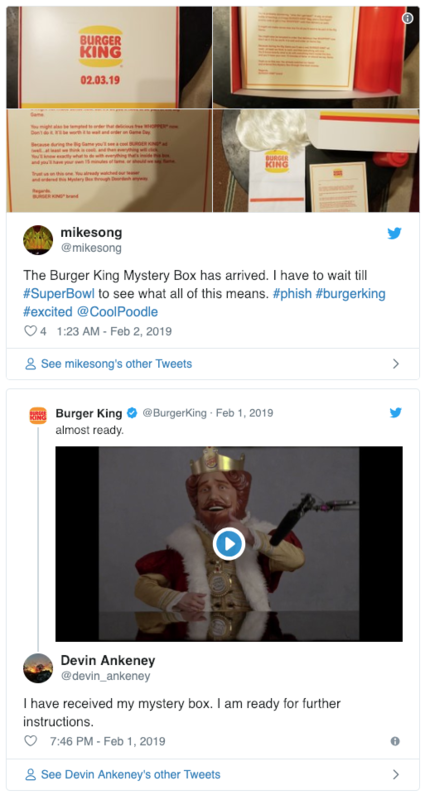 Additionally, people on social began asking what the “mystery” was and what Burger King had up its sleeve: there were 2,000-plus mentions of Burger King’s Mystery Box before the Super Bowl. 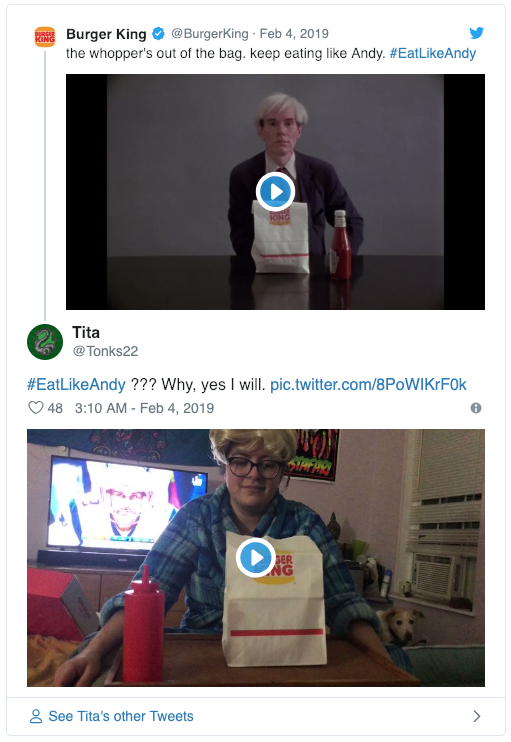 #EatLikeAndy has continued to inspire user-generated content with 10,000-plus uses of the tag, and publications such as Time magazine rationalized the spot for the public by calling it “refreshing” amongst a backdrop of Super Bowl clutter.